Conductor: Ben Cohen who with his music and his choir is guaranteed to transport you. Charpentier mixed popular carols into his midnight mass to produce one of the glorious Christmas works of the baroque era. In addition to the Charpentier, VAE and a consort of strings will include music of Poulenc, Villette, Corelli (and carols too). For over two decades, the Vocal Arts Ensemble of Ann Arbor has maintained a tradition of professional excellence in the performance of fine choral music. Founded in 1992 as a small chamber group devoted to a cappella singing, the group has solidified its reputation as one of the premier chamber ensembles in the region, performing several concerts each season. VAE performs with a core group of 24 and presents a highly varied repertoire, from Josquin to Bolcom. Benjamin Cohen, noted conductor, composer and playwright, became music director in 2000. VAE is a non-profit chamber ensemble run by an elected board of directors. The ensemble includes professional singers and instrumentalists, and enjoys a diverse membership drawn from the Ann Arbor area, with singers chosen on the basis of musicianship. VAE has been invited to perform throughout Michigan, collaborating with local artists and ensembles, and has been the featured choir with the Ann Arbor Symphony. VAE's distinctive and versatile programming, collaborative spirit and thirst to commission and perform new works have helped this special chamber choir carve a unique niche in the southeast Michigan concert scene. About Our Music Director, Benjamin Cohen Ben Cohen has been very active in the southeast Michigan music, theater and education community since coming to Michigan for graduate school in 1991. Since 2000 he has been the director of the Vocal Arts Ensemble of Ann Arbor, a premier chamber group, serves as regular choirmaster for the Ann Arbor Symphony; music directed many shows for AACT and UMGASS; and for 13 years was the music director of the Zamir Chorale of Metropolitan Detroit for which he was the founding director. For the past ten years he has been a proud teacher of choir and drama at Greenhills School in Ann Arbor, where he also directs an annual Shakespeare production, teaches a playwriting class and conducts the annual spring musical. Mr Cohen is also a composer for the stage; his works have been performed by professionals, children's groups and schools in New York, Boston and Michigan. He is the author and co-creator of Lay Your Comfort Down, originally performed as part of the Brown v Board commemoration at the Mendelssohn Theater, and is co-artistic director of Stage Write Productions. 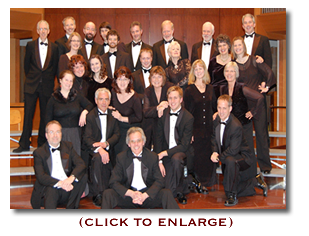 Copyright ©2012 by the Vocal Arts Ensemble of Ann Arbor. All rights reserved.